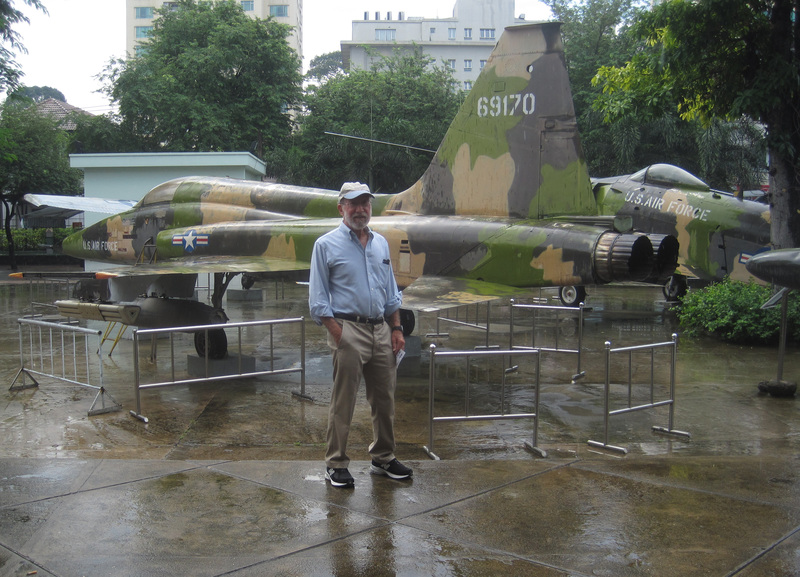 Last month California Native’s founder and president, Lee Klein, flew to Vietnam to participate in ITE HCMC, the International Travel Expo in Ho Chi Minh City (previously Saigon), where he met with representatives from the many nations in the Southeast Asian tourist industry. 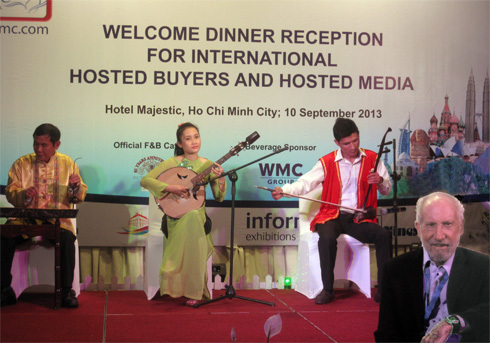 Included in the conference were representatives from the government tourist boards, tour operators, and transportation companies in Cambodia, Laos, Vietnam, Myanmar, Taiwan, Malaysia Indonesia and the Philippines. For many years the California Native has been operating exciting tours in Myanmar (Burma), China and Bhutan, and now it’s time to expand our offerings to other fascinating destinations in Asia. 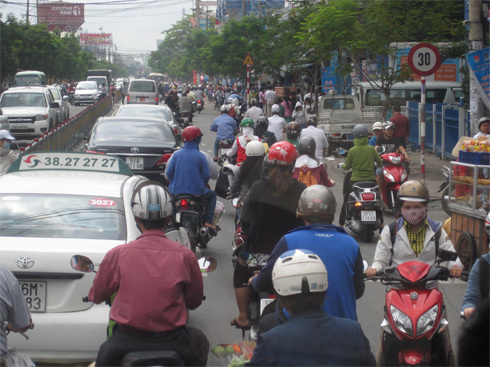 Traffic in Vietnam is a mad melange of motorbikes and cars. 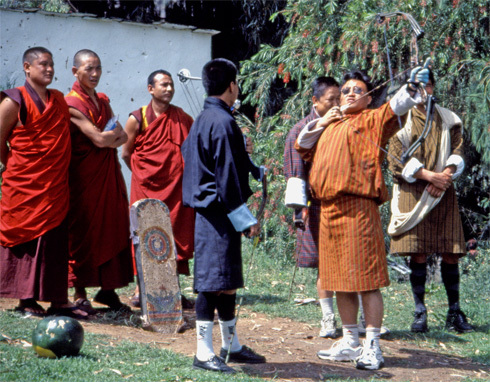 Dancing about and shouting sexual insults at the opposing team, Bhutanese sports fans enjoy their favorite pastime—archery! Archery? It may seem counter intuitive for a devoutly Buddhist nation to choose a sport like archery since Buddhists have a profound reverence for all living things. Participating in a sport where the equipment is primarily designed for hunting or warfare seems a bit out of place. However, judging by the fact that nearly all villages in the Kingdom of Bhutan have an archery range, passion for the sport is not to be taken lightly. Popularity of the sport can be traced all the way back to a 15th century legend. During this time, it is believed Lama Drukpa Kuenley, known affectionately as the “divine madman,” shot an arrow from Nangkartse in Tibet. Following the path of the arrow led him to Bhutan, land of the thunder dragon. Archery symbolism is present in Buddhist beliefs and often represents the offering of prayers. Today the matches are a festival of brightly-costumed archers and spectators alike. In fact, the activity is centered as much around the pageantry of the festival as it is around the competition of hitting the bulls-eye. Archers go to great lengths to distract or demoralize their opponents—even going so far as to dance in front of the other’s target! This behavior is not just limited to the archers—the women in the crowd act as cheerleaders, shouting raucous and degrading comments about the other team’s heritage and sexual prowess. All of the hullabaloo is in jest, and no one is ruffled by it or takes much offense. Nearly every village in Bhutan has an archery range. Wielding the traditional hand-carved bamboo bow (nowadays some use state-of-the-art compound bows), participants compete in teams of 15 players. Two points are given if the arrow hits any part of the target, three points for a bullseye, and if the arrow sticks in the ground within one arrow’s distance of the target, the team earns one point. The first team to score 25 points is declared the winner. To play, the archers are each given two shots during their turn. The field is set up like a horseshoe pitch, so team members shuttle between the targets in between shots. Not only is hitting the target difficult, but the walking back and forth across the pitch can be tiresome as well, because the small wooden targets are placed 140 meters apart! That’s nearly three times the distance of Olympic standards (a mere 50 meters) and probably why archers take the risk of taunting their rivals while standing in front of the target. The rival discouragement is a large part of the spectacle. 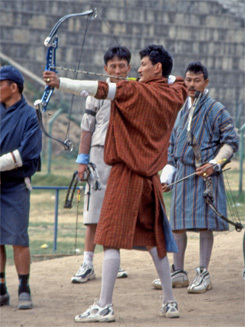 Archery is the only Olympic sport in which Bhutanese athletes compete. The Bhutanese have been involved in the games since 1984 and in the 2004 Olympics they made it to the second qualifying round. In the 2012 London Olympics, Bhutan sent two female archers, one of the smallest teams at the event. They remain hopeful that Olympic gold is in their future. For now, as in the past, the bowmen (and women!) from Bhutan continue to play for the love of the sport and the next chance to poke fun at their friends. 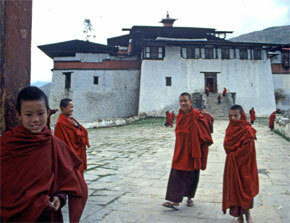 A group of young monks are happy to greet California Native visitors at a monastery in Bhutan. Drukpa Kunley was born in Tibet in the year of the wood-pig in the eighth cycle—or, as we would call it, 1455. As a child he was extremely precocious and had full memory of his previous incarnations. After his father was killed in a family feud, he became disillusioned with the world and dedicated himself to a religious life, eventually becoming a monk. In his early twenties, he gave up his robes and became a mendicant, wandering throughout the country and gaining mastery of the spiritual arts and magic. As he traveled through Tibet and into Bhutan, he purposely spurned accepted ways of behavior as a method of calling attention to the hypocrisy, selfishness and greed of the world and thus lead people to adopt honest and spiritual lives. His unorthodox methods of religious teaching seem most peculiar from our frame of reference because they were based on a very ribald and debauched life style. The great lama spent much of his time singing and drinking with young ladies and deflowering virgins. Reading the legends of Lama Drukpa Kunley is like reading Rabelais—both relying on the idea of divine excess. When he is not drinking chung (a sort of Tibetan beer) or making love to a maiden he is using his “Flaming Thunderbolt of Wisdom” to strike down evil demons. He is totally irreverent and ridicules the establishment, especially corrupt and self seeking priests. He performs magical feats—what the Judeo-Christian culture calls “miracles”—blessing or damning families, based on their moral treatment of others, turning tiny quantities of tea into amounts sufficient to quench the thirst of thousands, exorcising evil spirits, reforming demons, and instantaneously transporting himself to far off locations. In some of the stories he slaughters animals for their meat then, from their bones, restores them to life and sends them on their way. He is adored by the Bhutanese who, despite being a very conservative society who never show affection in public, protect their homes from evil spirits and promote fertility by painting cartoon images of flying phalluses on the outside walls of their houses. Near the town of Punakha, Drukpa Kunley founded a monastery dedicated to fertility. Each year hundreds of people come from all over Bhutan to pray for children. In the temple they are blessed by a monk holding a symbolic phallus. Tucked away in the green valleys of the Himalayas, Bhutan is indeed an exotic country, so different from ours, yet the Bhutanese people make us feel welcome and invite us to try and understand their ancient and tranquil ways. The more we see of their country the more we want to return. California Native founder, Lee Klein (center), along with our Bhutanese driver and guide, wears the traditional Bhutanese 'gho'. Soaring through the sky, on possibly the world’s most spectacular flight, the snow-covered peaks of the Himalayas come into view. On our left is Everest, the “top of the world,” accompanied by a vast panorama of the Earth’s highest mountains. We are headed for Paro, the only international airport in the Kingdom of Bhutan, aboard Druk Air, the Royal Bhutanese Airline. The word Druk means “Dragon,” and our flying dragon is the only airline allowed to enter the country. As we approach Paro, our plane drops steeply down and enters a deep valley, weaving its way between the mountains in a breathtaking and slightly scary descent to a smooth landing at the little airport, originally built by the British military. And then we are there, walking across the concrete to the small terminal building and our first visit to the “Shangri-La” country of Bhutan. Druk Air was established by Royal Proclamation in 1981 and began operations in 1983 when its first plane, an 18-seat German Dornier 228-220, landed at Paro carrying the Royal Flag of the Kingdom. The airline, whose fleet now consists of four aircraft, two British Aerospace 70 passenger BAe146-100’s and two new 124 passenger Airbus A319’s, is the smallest national carrier in the world. All takeoffs and landings at Paro are by Visual Flight Rules (VFR). This means that the pilot must be able to see the runway and all of the surrounding hills. He cannot land or take off using instruments. No flights operate at night or in poor visibility. Flights can sometimes be delayed up to a day or two due to inclement weather. The airline operates from Paro to six cities: Bangkok and Calcutta, four times a week, Katmandu and New Delhi, twice a week, and Dhaka and Yangon, once a week. Flights from Bangkok make a stop to take on extra fuel in case they cannot land at Paro and have to return. Druk Air’s safety record is perfect—they have been flying for twenty-three years and never had an accident! After going through immigration, (they have a photo on file of everyone scheduled to enter their country), and meeting our tour guide, we look back and see the airport staff closing the airport—after all, on most days there is only one flight in and one flight out of the country. We invite you to join us on a California Native tour to Bhutan, this amazing little country at the roof of the world. 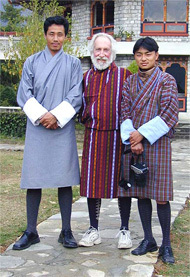 California Native founder Lee Klein wearing traditional gho with Bhutanese driver and guide. Seated astride a flying tiger, Guru Rimpoche entered Bhutan in the year 747 AD, to conquer demons and introduce Buddhism in this isolated area of the Himalayas. In this far off kingdom, mythology and history intermingle and ghosts, yetis, and demons are part of daily life. The name Bhutan is probably derived from the Sanskrit word Bhotant meaning “the end of Tibet” or Bhu-uttan meaning “high land.” The Bhutanese, however, refer to their country as Druk Yal, “Land of the Thunder Dragon,” and the Bhutanese flag, with its rampaging dragon, proudly reflects that. Bhutan is nestled in the Himalayas between China and India. On its southwestern border is the Indian state of Sikkim. To its north is Tibet. Almost the entire country is mountainous. The southernmost part begins in the humid jungles of India’s Assam Plain, but soon climbs high into the Himalayas. There is only one airport in the country and that is in Paro, a deep valley at 7,300 feet elevation, surrounded by 16,000 foot mountains. Only one airline flies into Paro, Druk Air, the Royal Bhutanese Airline. The flight to Paro is one of the most spectacular in the world. Flying over the Himalayas, the plane descends steeply between snow capped peaks flying through the narrow valley to land at the tiny airport. Bhutan’s capital is Thimphu (pronounced “Tim – Pu”), a thriving metropolis of around 40,000. The population of the entire country is only 750,000. The country is a monarchy, ruled by His Majesty King Jigme Khesar Namgyel Wangchuck, 31 years old, making him the world‘s youngest monarch. Being a tiny country sandwiched between two of the largest countries in the world, Bhutan makes it a top priority to maintain its traditional culture. 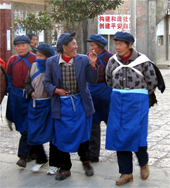 For all business, official, and religious occasions people dress in the traditional costume, men wearing the gho, a long attractive robe made out of wool or silk and tied about the waist, and women wearing the kira, an ankle length dress made from fine woven fabrics with traditional patterns. School children all wear their school uniform ghos and kiras. The schools, incidentally, are required to teach their students in English as well as the official language which is Dzongkha. Houses and other buildings in Bhutan are built in the traditional style, as dictated by religion and law. The houses are generally two stories, constructed of wood and mud and elaborately decorated with carvings and paintings of Buddhist symbols. The roofs are made with wood shingles held in place by stones. On the top of every house is a colorful prayer flag. The major towns are dominated by the dzong, a huge white fort which serves as a combination government headquarters and monastery. The system of dzongs began in the twelfth century and the newest dzong was constructed in 1998. There have been many fires in the dzongs over the years due to the hundreds of burning yak butter lamps. According to the Buddhist religion, when a person dies he is reincarnated. When a great lama dies his reincarnation is identified and the child is taken and educated so that he may continue the good work of his previous incarnations. Lamas may marry, but only in every other lifetime. “AAARRGH! The yeti, “Abominable Snowman,” or mirgu, as it’s called in Bhutan, has been a legend throughout the Himalayas for centuries. They are even depicted in ancient Tibetan and Bhutanese manuscripts. The Kingdom of Bhutan has set aside an area specifically for the yeti, the Sakten Wildlife Sanctuary—a sanctuary for a creature that local lore claims is invisible! While in Bhutan, I was told that not only is the yeti invisible, but his feet point backwards to avoid being tracked. On their unsuccessful attempt to climb Mount Everest in 1923, a British expedition spotted a line of creatures moving along a cliff face. When they arrived at the location they found huge humanoid footprints in the snow. 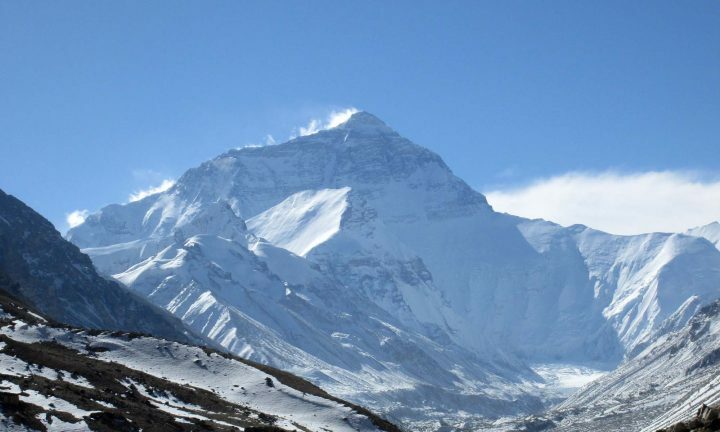 Twenty-six years later, Tenzing Norgay, who along with Sir Edmund Hillary, was the first to reach Everest’s summit, saw a Yeti playing in the snow. 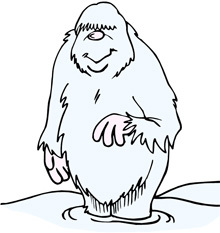 The yeti has been described as a wildman, half-man half-beast, covered with reddish brown hair but with a hairless face. The descriptions are similar to North America’s “Big Foot.” Many theories have been advanced as to the identify of this “abominable snowman.” Some scientists believe that the yeti is a form of ancient man, a “missing link.” It has been theorized that it is a form of Homo Giganticus, an unproven subspecies of humans. So far expeditions which have set out to capture or photograph the yeti have returned without positive proof of the creature’s existence. Reinhold Messner is a writer, film maker, and a member of the European Parliament. He is also considered to be one of the world’s greatest mountaineers, having climbed all of the world’s 8,000 meter peaks, and being the first man to climb Everest without oxygen and to climb it solo. In 1986, while leading an expedition in Nepal, he encountered a yeti. The Tibetan bear, a rare species related to the grizzly, while traveling through snow, puts his back foot in the footprint of his forefoot, giving the appearance of a two-legged animal. Messner came across the footprints of a yak, followed by the footprints of a yeti. He followed them to the carcass of the yak, killed by a single blow. It had been stored underground in the same manner a bear stores his kill. He journeyed to a remote village in Pakistan, where legends tell of a woman who was kidnapped by a yeti and lived with it for two years. Traveling with a local guide, Messner came across a sleeping “yeti” and got to within 20 yards of it. It turned out to be a Tibetan bear, and very angry at being awakened. Messner jumped and yelled and the bear ran away. And what about our own Big Foot or Sasquatch? Messner believes it is probably a grizzly bear. The Summer/Fall 2009 edition of The California Native Newsletter is now in the mail. The newsletter, published by The California Native since 1984, has more than 10,000 readers (not counting those who download from the web). If you are not already a subscriber to this free newsletter you can signup now. 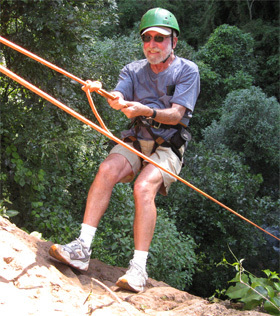 Costa Rica has long been a favorite destination for both the beginner and the experienced river runner. With ample annual rainfall, mountainous landscapes, and plenty of road-to-river access, the country prides itself on being a whitewater paradise. In 1880, Alexander “Boss” Shepherd, the last territorial governor of the District of Columbia, packed up his family and, in the remote village of Batopilas, at the bottom of Copper Canyon, developed one of the richest silver mining operations in the world. Because the Olympics were hosted in Beijing, chances are that you learned more about China in 2008 than at any previous time. On the other end of the country, far from bustling Beijing is Yunnan Province—home to the largest variety of ethnic groups in China. 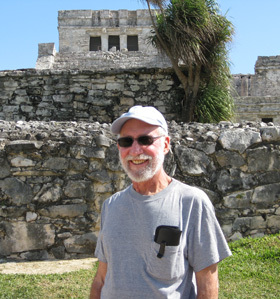 The newsletter also includes schedules, prices and descriptions of California Native’s tours to Mexico’s Copper Canyon, Peru, the Galapagos, Patagonia, Costa Rica, Yucatan and Chiapas, Myanmar (Burma) and Laos, Bhutan, Yunnan, China, and Ireland. As Bhutan celebrates it’s one year anniversary as a democracy, ABC will be airing a special, “Michael J. Fox: Adventures of an Incurable Optimist” on May 7. On the show, Fox, who suffers from Parkinson’s disease, traveled around the world interviewing optimists. One of his favorite stops was Bhutan, dubbed the happiest place on earth by many visitors – because locals live in a state of permanent joy. In Bhutan, a country which measures its success with a figure for “Gross National Happiness” instead of Gross National Product, Fox revealed that his symptoms actually eased during his visit. When questioned about his impression of the people of Bhutan, the film and television star was quoted as saying, “They really are (the happiest people). It’s amazing. They’re just beautiful people. I don’t know whether it was the altitude or the thinning of the blood or whatever, but I had much less symptoms,” he added. 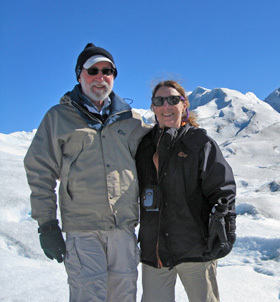 For many years The California Native has been offering private tours of this magical Himalayan kingdom.